Centuries-old rooms have been renovated and are at the disposal of those who are looking for something very special: the "Falcon Nest" consists of two rooms - for comfortable sleeping and comfortable living for 1-2 persons. The special feature is that you live above the chapel in the historic tower and have uninterrupted views in all directions: over castle, courtyard and nature. If you want to get into the falcon's nest, you have to climb a narrow, relatively steep staircase. Please keep this in mind if you find it difficult to walk. The falcon nest is a very romantic place to stay. Ideal for couples and honeymooners. But also ideal for single travelers looking for a comfortable, well-protected neighborhood in a unique environment. Non smoking home! Our moated castle offers you five original holiday homes that have one thing in common: peace, romance and castle character. Surrounded by the protective moat with colorful fish in it, you will experience a world that is only very rare in Germany: A private castle that is still inhabited today and invites you to stay for a while. The apartment 'Burghäuschen' has 2 bedrooms, bathroom, living room with kitchenette and a cozy fireplace. The 'Castle Apartment' captivates with its architectural uniqueness, historic decor and painting of ceilings and walls as well as modern comfort. The 'Falcon Nest' combines a unique view from the chapel tower in all directions with comfortable living for 1-2 people in historic walls! Finally, big families or 2-3 couples feel at home in the 'Gärtnerhaus': it can accommodate up to 6-8 people! The Alte Brauerei offers space for families or groups traveling together on 2 uncomplicated, hard-wearing, spacious floors with 10-13 beds. It expects you a unique domicile, which lets you forget stress and everyday life. You have the opportunity to immerse yourself in a world as our ancestors knew it. Be our guest and relax in peace, romance and wonderful nature - without having to miss the comfort of modern times. We strive to ensure you a truly relaxing stay. Cycling and hiking paradise on the doorstep: The excellent trails start just beyond the moat. Whether with dog, bike, children or just on foot - here everyone gets their money. A walk through the charming landscape around the castle relaxes and lets forget everyday life. And if you do not want to leave it on a simple walk, the hiking paradies of Rhön beckons with almost inexhaustible paths in mountain and valley, steep and flat, on the river or in the raised bog. 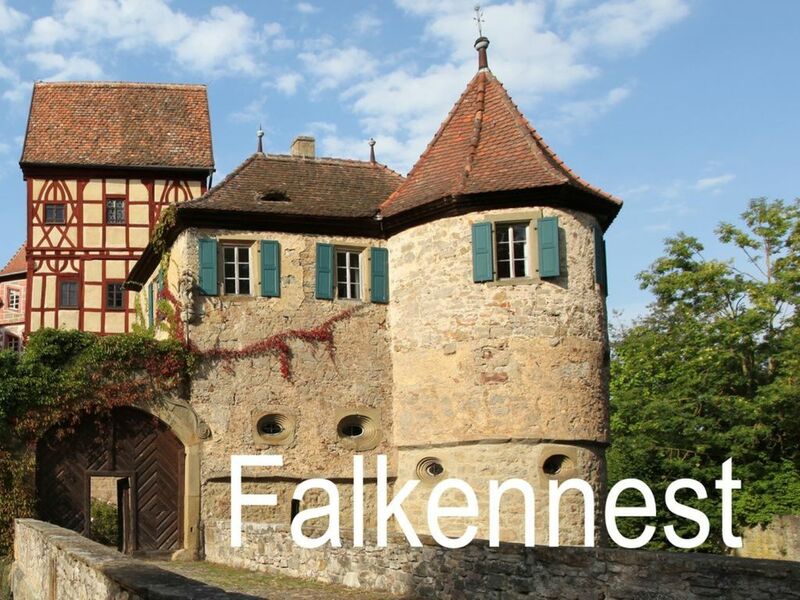 Varied excursion possibilities: The environment invites to trips of quite different kind: Culture in Meiningen, Würzburg, Fulda and surroundings. Not to forget in Bad Kissingen and other health resorts, which come up with a demanding and extensive concert and theater program in summer. Bathing enthusiasts will find fun and exercise at reasonable prices at the Triamare in Bad Neustadt / Saale. But also at the lake a few miles away. In the almost round bedroom you expect a comfortable double bed (2 high quality mattresses à 200x100 cm) and a lot of cosiness. The living room invites you to relax. Read a good book, listen to music, watch TV - let it all hang out! You will feel like so many of our guests: the everyday life and its worries disappear in the distance. Ancient walls, falcons and kingfishers, historic ambience and idyll, stylish surroundings and an atmosphere that is unique will fascinate you. Washing machine use possible for a fee. The microwave is a combination appliance. It can also be used as a convection oven and barbecue. Breakfast service on request for an extra charge possible! Non smoking home!